Anna Hazare, a grass root activist from a small village flashed suddenly on India's national canvas with his anti-corruption campaign. In spite of his old age, humble background & simple life style he had huge followers, that too including youths. Clearly his Charisma was in action. Events that unfolded during his anti-corruption campaign highlights three important ingredients of Charismatic leadership. Integrated Personality: Charismatic leader shows integrated personality. Often the roots of such personality is found in their spiritual practices and simple living. 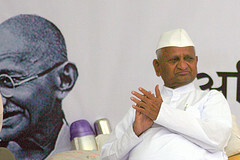 Vivekananda's influence on Anna Hazare and his Gandhian way of living contributed to his charismatic influence. Crisis and Public Hope: Chain of high profile corruption scandals in 2010 were not less than any crisis in India . Though Indians are not new to corruption ,still the sheer scale & frequency of these scandals shattered national image.It upset every Indian mind. Anna's call of "anti-corruption" was perfect in time for the crisis. It addressed the need & hope of billions. Radical Solution: Demand of Lokpal bill and its aggressive timeline was absolutely radical in the snail-paced policy world of India. Though the demand is heavily criticized by policy-makers , it fulfilled expectations and hope of followers. This further bridged the link between followers and Charismatic leader. Changing the sleeping Blog ..